OMG you guys! This espresso vanilla almond butter is the bomb. The idea for this came to me after I heard about this product. While that almond butter looks and sounds tasty, it does contain agave, which I avoid. So I wanted to try a homemade version of the espresso vanilla almond butter. Mine came out delicious and it was also very easy to make! This recipe takes almond butter to the next level. I suppose if you didn’t want to make the almond butter, you could make these into no bake cookies as well. 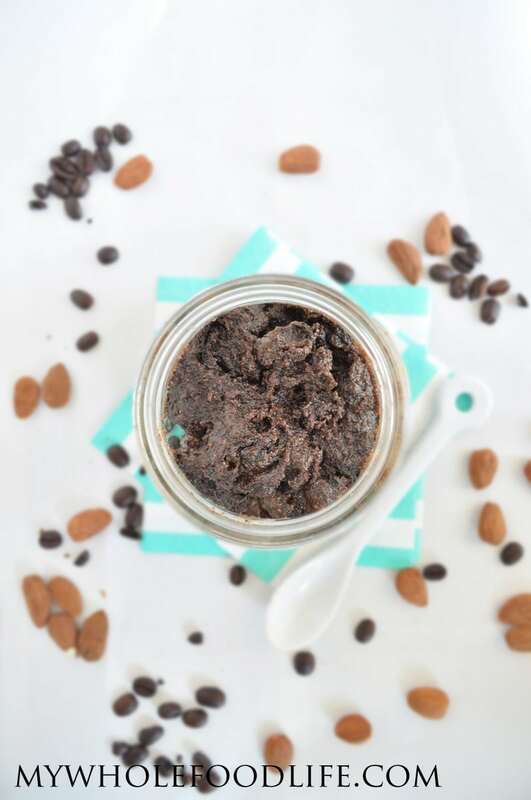 If you are a lover of all things coffee flavor, you will love this homemade almond butter. You might also like this and this. Gt your almond butter with a kick! In a food processor , combine the almonds, vanilla beans and coffee beans. Blend for about 5-7 minutes. Then add in the remaining ingredients and blend. If the mixture looks too dry, you can add water until you get a desired consistency. You could also add a little oil if you like. Please store this almond butter in the fridge. It will last a couple weeks that way. **Note: Due to the caffeine in this, I would not recommend giving it to children. This sounds wonderful. I need to get some vanilla bean, but this is definitely on the list. So glad you share all your great ideas and they are healthier to boot! Yay!!!! Thanks Jul! I hope you enjoy it. This sounds so good! I love coffee flavors in food or desserts! I make a similar almond butter, roasted, and use cinnamon and ginger for a spicy kick, instead of coffee. I can't wait to try adding coffee beans next time! Yum! Thank you! Ginger in almond butter sounds great too. I may try that. Do you use fresh or dried? This sounds fantastic Melissa! I've heard of that product too but we can't get it over here so a homemade version is perfect. Love the new look by the way. I've been away so must have missed the changeover. Wow Melissa, this sounds great, once I finish the jar I bought at Costco, I will try your homemade version. You really work fast, thanks for sharing. Do you soak almonds before grinding them? Can I use vanilla extract instead of vanilla bean? 1tsp of extract? Yes, but since this is not cooked, you may taste the alcohol a little. Melissa this looks divine! I would love some of this for afternoon tea with my rice cakes! I made this with pecans because almonds bother me...it is VERY yummy! Thank you for so many great recipes! You are so welcome Anita! Glad you liked it!